Let's get one thing straight from the start: Dogs do not destroy things out of spite. Most of the time they do so to relieve tension caused by stress. Just as people sometimes smoke, eat, drink, or take drugs to cope with tension, dogs chew. The solution lies in relieving your dog's tension and unhappiness, and if that is not possible, in confining him to prevent further damage to your possessions and to himself. You will notice that there is no mention of punishment for destructive chewing. The reason for this is illustrated by a story told in chapter 1. Most punishment for destructive chewing is given hours after the chewing has taken place, as dogs are usually most upset right after their owners leave. The dog doesn't understand why he is being punished, although some owners mistakenly assume their dogs know because they behave in a submissive manner. The dog acts afraid because his owner is angry, not because he knows he has done something wrong. Not only does punishment not work, it can actually make matters worse because it will make the dog more anxious and therefore more likely to chew in the future. Like all behavior problems, destructive chewing is affected by your dog's personality. Different things stress dogs with different personalities. If your dog is dependent, he will be stressed by being left alone. A high-energy dog is stressed by lack of exercise. A highly reactive dog is stressed by too much stimulation. To know how to work on chewing problems, you first need to figure out whether the chewing is caused by boredom or separation anxiety. A dog with separation anxiety will show signs of nervousness before you leave. He may follow you around, whining, panting, drooling, or trembling. He might howl and whine when you are gone. The destruction usually occurs around doors or windows. A dog might urinate or defecate in the house out of stress, although this may simply be a housebreaking problem. A dog with separation anxiety is truly panicked when you leave. Separation anxiety can be a very difficult and time-consuming problem to solve. It's different from training your dog to do something; you are trying to change his emotional response when you leave. This means associating things like picking up your keys with treats. You can find more information on a program like this from a behavior specialist or a book on separation anxiety. If your dog is a "Velcro" dog, attached to you at all times, you can teach him a sit-stay and gradually increase the distance until you can go into another room. A truly terrified dog may need medications, but medications alone rarely help. If your dog is chewing because he is bored, he will mostly choose fun things to chew on or things with your scent on them. He might tear apart a sofa cushion and enjoy scattering foam all over the living room, or using the TV remote as a chew toy. The solution to this kind of chewing, besides confining your dog while you are away, is to provide your dog with more exercise and mental stimulation. Provide him with a special distracting toy when you leave, something he doesn't get any other time. Try filling a Kong toy or hollow bone with squeeze cheese or peanut butter mixed with dog food. Take him on car rides with you. An obedience class based on positive reinforcement is great for mental stimulation. An agility class could combine both exercise and fast thinking for you and your dog! Your dog might benefit from a midday visit from a dog walker. Some dogs with separation anxiety can tolerate the regular hours of separation that occur when their owners go to work, but are stressed if their owners leave them at unusual times, such as going out in the evening if they work during the day. Such dogs may need to be confined only during those unusual times. Destructive chewing can be cause by fear, like fear of thunderstorms. This chewing will also be directed at doors or windows. Use a crate. Speak to your veterinarian about an anti-anxiety medication that may help, especially if he might injure himself in a crate. Destructive chewing can also be caused by something happening outside the house that frustrates your dog, or even frightens him. The molding around a window can be destroyed because a car accident occurs outside the house while the owner is away and the dog is upset by all the commotion going on outside. If the chewing occurs near a door or window, look for something outside your house that is frustrating your dog. Are there squirrels playing outside where your dog can see them? Do many people walk dogs by your house? Is your dog afraid of loud noises that frighten him when he is home alone? My Greyhound offers a good example. While she is not at all upset if I drive away from the house, she is terribly frustrated if I go out to my dog training building, which is just 20 feet from my back door. From my bedroom window she can see into the window in the door of the building and catch glimpses of me as I move about. Her reaction is to grab a magazine lying on the nightstand and tear it to shreds. There are magazines lying all over the house in all sorts of accessible places, but these are the only magazines she ever touches. If this kind of frustration is causing your dog's destruction problem, either change what is happening outside or restrict your dog's ability to see outside. Puppies chew out of curiosity and playfulness. Use a bottle of a bitter-tasting solution purchased at a pet supply store to discourage him from chewing. Spray it on furniture legs and tissues in the trash can. That way you will not have to get your relationship off to a bad start by constantly having to correct him. 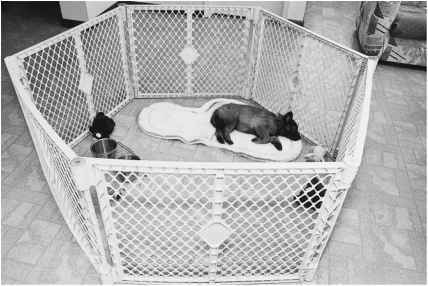 Confine your puppy when you are away, for his safety and the safety of your house. Your dog may be one to two years old before you can trust him loose in the house. Dogs sometimes chew simply because they like to chew. They like to gnaw on something hard and to shred things into little pieces (causing the demise of many chair legs and foam pillows). Make sure your dog has plenty of safe things to chew. Mine seem to get a lot of satisfaction from something as simple as ripping apart an empty cardboard box. If you have any doubt about the safety of something you want to give your dog, such as rawhide bones, check with your veterinarian. Finally, a behavior problem with a simple solution. Does your dog get into the trash? Put it away! Many dogs today are dying early because of misinformation about proper dog care. 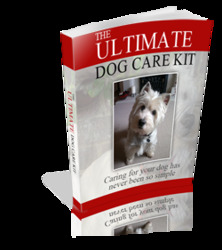 Learning How to Take Proper Care of Your Pet Dog is Crucial to a Long and Happy Life for Your Pet. Learn How to Make Sure Your Dog Lives to His or Her Full Potential of Life.